The advancement and popularity of technology has enhanced the importance of digital marketing in the last few decades. Digital marketing can be implemented for any business in any industry and is soon going to surpass the traditional marketing custom. The online tools used in marketing provide ease of access, competitive advantages and effectiveness as opposed to the traditional marketing idea. Marketing has always been about connecting with audience in the right place and at the right time. The current marketing arena involves marketers implementing modern services, platforms and software to design, accomplish and enhance their marketing. For connecting those dots the best medium is internet where people use to spend most of their time. Customers’ requirements and interests can easily be obtained by determining the amount of time any individual has spent. Modern trends such as mobility, analytics, cloud, and big data are making work easier in collecting data. In an effort to help marketers attain a sophisticated customer base, a panel of prominent CEOs, CIOs, VCs, analyst, along with the CIOReview editorial board has assessed scores of marketing solution providers and picked out a list of prime choices. We have considered the vendor’s ability in designing and building advance solutions that cater to industry specific needs, at the same time adding to functional and productive flair of marketing. 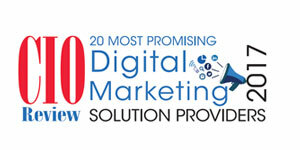 We present to you CIOReview’s 20 Most Promising Digital Marketing Solution Providers 2017.